The N.C. Chronicles. : Aboriginal children used in medical tests...Canada. Aboriginal children used in medical tests...Canada. In an interview with CBC Radio's All Points West on Tuesday, Justice Murray Sinclair told host Jo-Ann Roberts that commission staff has "seen the documents that relate to the experiments that were conducted in residential schools." "We do know that there were research initiatives that were conducted with regard to medicines that were used ultimately to treat the Canadian population. Some of those medicines were tested in aboriginal communities and residential schools before they were utilized publicly." "Some of those medicines which we know were able to work in the general population, we also have discovered were withheld from children in residential schools, and we're trying to find the documents which explain that too," Sinclair said. "Our government recognizes that the relationship between Canada and First Nations has helped shape the country we know today," Aboriginal Affairs Minister Bernard Valcourt's director of communications Jason MacDonald said Wednesday in a statement. "While we cannot undo the past, we can learn from it and ensure that those dark chapters are not repeated." MacDonald said that is why the Conservative government apologized for the residential school policy and "that is why we continue to focus on the work of reconciliation, on improving living conditions for First Nations, and on creating economic opportunities for First Nation communities." What helped shape the country we have today is the annihilation of multiple nations and it's people, I suggests he visits reservation and see if those dark chapters are gone. Maybe he should live in one for a year, especially the poor ones up north? That way he can see if there is any "improvements." However, the commission has not been able to obtain documents "related to experimentation that went on in aboriginal communities outside of the residential school setting." "We haven't seen those documents," the chair of the commission told CBC News. Valcourt's office has said they have turned over 900 documents related to this to the work by the commission. On Thursday, Assembly of First Nations Regional Chief Bill Erasmus told CBC News in a written statement that "the federal documents show that the government either doesn’t know what’s in its own records or that there may be an effort to actually suppress information." Erasmus called on the federal government to provide all relevant documents to the commission. "We believe that what’s already been exposed represents only a fraction of the full, true and tragic history of the residential schools. There are no doubt more revelations buried in the archives," Erasmus said. In January, an Ontario Court ordered the Canadian government to turn over all residential school archival documents to the Truth and Reconciliation Commission, and while the federal government has expressed a willingness to comply, Sinclair said "we haven't seen the documents start to flow yet." "It's a question of capacity and whether they have sufficient resources and time to be able to get them to us before our mandate as a commission expires on July 1, 2014." Sinclair said that if the federal government is unable to turn over all of the documents from Library and Archives Canada before the commission's mandate expires next summer, the commission may have to turn to the courts once more. But a final report without all the documents would not be a "truthful" report, according to Sinclair. "The report itself, in our view, only complies with the mandate if we are able to write a full and complete history of residential schools and in order to do that, we need those documents," the chair of the commission told CBC News. The residential schools system, which ran from the 1870s until the 1990s, removed about 150,000 aboriginal children from their families and sent them to church-run schools under a deliberate policy of "civilizing" First Nations. 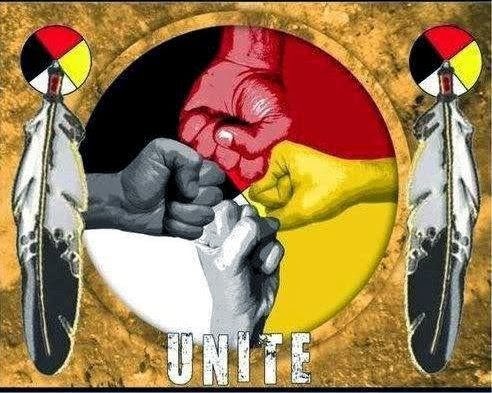 TRADITIONAL leaders, Elder, Clan mothers, Warriors, should get together, assemble all nation of Turtle Island, and once and for all, through OUR justice system, a final judgement on all historical and living person, who committed crimes against the people of this land....Put into a native archive for the future generations, the truth, names and policies of extermination adopted by those who stole the lands. It's time we started to reveal what really happened...not according to their history but ours.